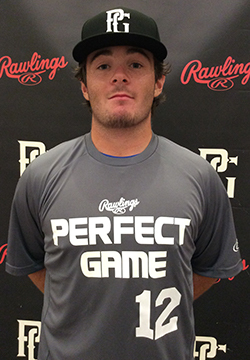 William Shea is a 2019 RHP/OF with a 5-9 161 lb. frame from Fort Myers, FL who attends Canterbury HS. Medium athletic build. Efficient on line delivery with a high 3/4's arm slot, short and compact arm circle, can use lower half more to help generate velocity, very repeatable mechanics. Steady low 80's fastball, very aggressive attacking the strike zone with his fastball, fastball gets very heavy sinking and running life. Very advanced change up for his age, can use it whenever he wants with plus command and feel. Curveball is his third pitch but it is solid, with 11/5 shape and some late biting action. Plus present command and really knows how to pitch. Right handed hitter, hits from a narrow stance with a short downward swing and a middle of the field line drive approach. 7.24 runner. Good student.